I have been looking for new dining chairs for our home to replace the very eclectic mix we had around our dining table for some time, since the house renovations. We had a couple of vintage office Eames, a vintage Harry Bertoia chair bought on eBay, a new stainless-steel Bertoia from the Knoll sample sale, a couple of cardboard stools from Story Deli and some very bright green garden chairs from Ikea, which added a cheerful pop of colour but wasn’t exactly what I had in mind for this room which has now, very soothing hues of pale grey and white. And then I saw the new Moda chair launched by Cult Furniture. The Moda dining chair combines Scandinavian modern simplicity with function and the price was also really attractive considering I had to order 8 chairs. 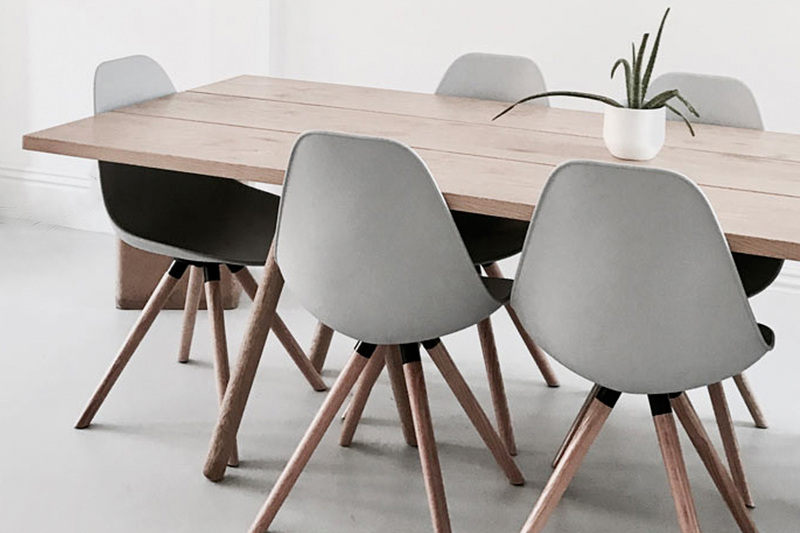 The Moda chair comes with three different leg styles to choose from (+ an armchair version) but my favourite was the wooden legs version to echo the wood of our large dining table. My goal was to add chairs that would contribute to the soothing, minimalist feel of the room without being in your face and at first, I wanted to get these white chairs. Funnily enough, the black metal part of the legs was bothering me a bit and on this account, I was tempted to try something different with the copper version but the copper and gold versions were not available for immediate dispatch and I was determined to sort this dining chairs issue out before leaving London. Eventually I asked Steve if he preferred the Moda chair CD2 in white or light grey and of course, he picked light grey to add contrast… Given that our resin floor is light grey, I was ok with both and thought it would be a nice change from the usual white. This turned out to be an excellent decision. While I have no doubt, the white chairs would have looked great in this room, I really like the soothing soft grey of these chairs and it turned that the black metal part that bothered me, works very well in the room as it echoes the MEOW black print I left on the floor on purpose. When I sit on our sofa and look at the room, I see now a very pleasing and relaxing hue of wood, light grey and white and endless styling possibilities to transform our dining table with scented candles and nice tableware for any given dining parties. Some of you may have seen on Instagram stories that the seats and legs come in different boxes but the chairs are super easy to assemble. They come with a key to screw everything in and you don’t need any tools or men to do this. I was just missing two round elements to assemble the last chair but Cult Furniture is sending them to me. A little assembling tip for you: I found the best way to put the chairs together is to put the seat upside side on your table so your legs are leaning against the back to the chair and then play around to fix the legs. Once both holes from the seat and the legs are perfectly aligned, it’s a real piece of cake to put them together. // Photography & Styling by Karine Köng | Posted in partnership with Cult Furniture, all views my own. Great article, information provided are valuable. Points are described in a good and easy way. Thanks for sharing .